What you eat, drink, breathe and supplement with will have a huge impact on your skin. We all know ” a moment of sugar on the lips, may give you extra inches on the hips”, however we don’t usually associate sugar with skin issues, but we should. I have seen over and over again in my patients that diets rich in sugar and certain carbohydrate type foods (which eventually convert into sugar during digestion) can be a major problem for skin health. Not all carbohydrates are created equally. Carbohydrates that are processed and gluten containing can cause imbalances in your gut bacteria, which can in turn cause inflammation in your body affecting your hormones, which are your body’s messengers. If you continuously consume high amounts of sugars and harmful types of carbohydrates, your body will not be able to sustain the large amounts of inflammation and it will show up on your skin as various levels of congestion such as redness, acne, large pores, black heads and dry and pigmentation patches, not just increased inches your waistline. Another process in addition to inflammation that happens in your body when you consume sugar and carbohydrates is Glycation. Glycation is a process that occurs when you digest sugar; glucose is released into the blood stream, which then attaches itself to collagen, the important protein that keeps your skin firm and smooth. This attachment causes collagen to be rigid and inflexible and then we see an increased risk for sagging skin and developing wrinkles prematurely. The key culprits are not only sugar infested foods such as cakes, cookies, candies, and ice cream, but pastas and bread can equally cause problems with your skin as these foods convert to sugar and can be compared to having the same effects on your skin as a chocolate bar. High fructose corn syrup and other liquid sugars may cause the most collagen damaging produce more collagen-hurting molecules than anything on the dessert menu. Hidden sugars like barley malt, dextrose, fruit juice concentrate, fruit drinks and sodas all harm the skin the same way as the process of glycation if not worst. Clean drinking water makes skin cells plump naturally hiding the wrinkles. The question is, can certain foods give your skin the natural lift it needs to stay looking young and healthy and reverse the damage caused from a poor diet? The answer is absolutely yes. Your body has an innate ability to heal itself given the right diet. Your glowing skin is a reflection of your diet. The foods our bodies require for glowing skin requires a combination of anti inflammatory foods rich in vitamins and omega 3 fatty acids. Anti -inflammatory foods not only helps keep your skin looking flawless but help support insulin and blood sugar levels in your body. More and more research is pointing evidence that chronic inflammation in the body is the root cause of many illnesses and an anti inflammatory food diet is the cure. Your skin will be the barometer of these illnesses. Inflammation can be described in the body like a slow burning fire to a blazing fire, damaging the body slowly to quickly. The only way to keep this fire in check is to put out the fire or prevent it from starting by encouraging a combination of foods rich in antioxidants, vitamins and omega fatty acids. Here are some of my favorites combinations you can add to your breakfast, lunch and dinner meals. Spices: Tumeric, a yellow pigment from curcuma longa, is a major component of turmeric and is commonly used as a spice and food-coloring agent. I have found this spice not only useful as an antioxidant for the inside of the body and also I have seen great results topically on the skin for acne nd skin inflammation. You can mix tumeric with honey and use this as a face-mask and you can mix this spice in with your rice, quinoa and in your curries for the internal anti -inflammatory. Berries: Blackberries, blueberries, cranberries, strawberries and raspberries are high in antioxidants and have anti-inflammatory effects. 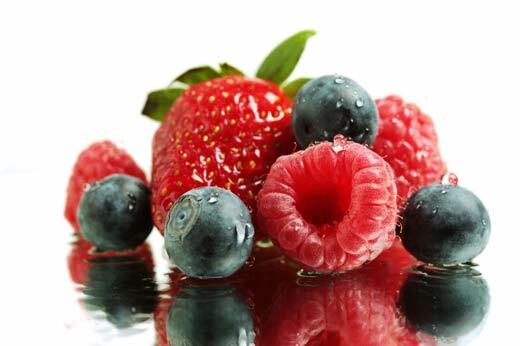 Berries are rich in vitamin C, which is beneficial for your immune system and your skin. Vitamin C helps with wound healing as in the case of acne recovery as well as vitamin C increases the production of collagen that in turn strengthens the capillaries that supply your skin. Berries can be added to your cereal in the morning or eaten as dessert. Fish: Salmon, anchovies, mackerel and sardines are rich sources of omega-3 fats. Omega 3 fatty acids not only help combat wrinkles and lines, but other skin problems as well, including acne, eczema, psoriasis and dry flaking and oily skin. Seeds and Nuts: Flaxseeds and walnuts also supply omega-3 fats called ALA (alpha-linolenic acid) and Vitamin E. Vitamin E protects the skin from oxidative (cell) damage and supports healthy skin growth. Cruciferous vegetables: broccoli, cauliflower and bok choy are rich in anti inflammatory compounds and phytonutrients such as Sulforaphane. Not only has these compounds been shown to be anti cancerous, but these vegetables have been shown to help balance female hormones thereby helping your skin to be free from acne and hormone related problems. Vitamin C, 1000 milligrams a day. Calcium/Magnesium: 500-1000 milligrams of Calcium and 500 mg of Magnesium per day, depending on your dietary intake of these minerals. EPA/DHA: 2-3 grams per day (molecularly distilled and certified to be free of heavy metals). How To Avoid Common Fitness Snags!